Congratulation you got a Ixora Carrier Board. Here your first steps to get it running. Insert the Apalis Module to the MXM connector (X1). Connect a mouse to the USB host port (X7). Connect a monitor to the HDMI port (X24) or use EDT Unified Interface Display. If you do not have any display, use Remote Display Tool to see WinCE desktop on your development PC. Connect 12V DC @ 3A power supply (recommended). Press On/Off button on Ixora Carrier Board to power-up the board. Now, you should see the the WinCE desktop on the connected display. 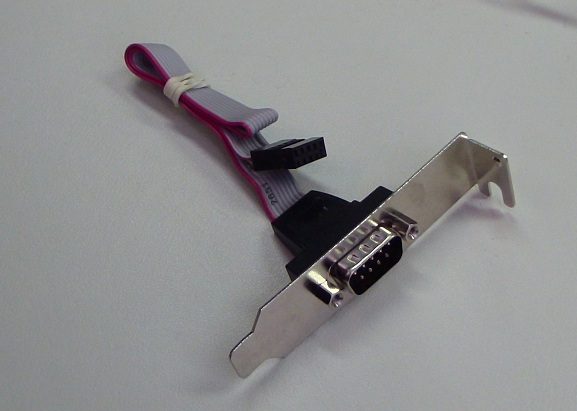 You will need one serial adapter cable as shown below. X22 accepts a standard 10 pin IDC to 9 pin D-sub male connector. Unfortunately there are different standards. The standard we used is normally called DTK or Intel standard. Please check the pinout in the Ixora Datasheet. You will further need a regular null modem aka cross-over cable to your PC's serial port or USB to serial adapter. Connect serial adapter to X22 and other end to development PC.